This blog post is written by Katherine Liu, Communications Intern with Heartland Alliance. 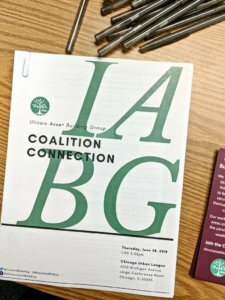 IABG held its first biannual Coalition Connection meeting last month. These new coalition meetings provide opportunities to network with asset building practitioners and community leaders, learn about financial capability programs, and work together to advance policies that support the financial prosperity of Illinois families. After an icebreaker (fueled by M&Ms and a shared commitment for equity and economic security) and a presentation on Secure Choice, a new retirement savings program, we split into breakout conversations where topics included everything from financial coaching models to fines and fees, cryptocurrency and the digital divide, and new policies that will affect Illinois families. See the full agenda to view all of the breakout sessions and learn more. I attended the breakout conversation on new policies that will impact Illinoisans. It was facilitated by United Way of Metropolitan Chicago’s Ayom Siengo, who was joined by Brent Adams from the Woodstock Institute and Kim Drew from Heartland Alliance. They shared four important policies that will be rolling out this summer and fall, and what you can do to support each policy. SNAP (Supplemental Nutrition Assistance Program) eligibility has been expanded to community college students enrolled in certain career and technical education courses of study. Approximately 40,000 new community college students are now eligible for SNAP. These students include those from SNAP-eligible families who did not previously qualify and individuals who are at school and employed part time or more. What you can do: Get the word out to your participants, organizations, and organization partners so that newly-eligible students can learn about this policy change and enroll in SNAP! The new budget implementation bill increases Temporary Assistance for Needy Families (TANF) grant amounts from the current level (on average 22.25% of the Federal Poverty Level or FPL) to 30% of the FPL. What you can do: Families receiving TANF will automatically see an increase in their grant amounts on October 1, 2018. However, there has been a decline in the uptake of TANF, and some eligible families are even discouraged from applying. You can help by making sure that caseworkers know the TANF eligibility requirements and actively encourage families to apply. You can also read the press release about the TANF increase. On July 1, currency exchanges were required to decrease their current check cashing rates for public assistance checks to 1.50%. Previous rates were 1.40% + $1 for public assistance checks $100 and below, and 2.25% for public assistance checks above $100. For other types of checks, some may see an increase to the check cashing rates. What you can do: While the rate decrease for public assistance checks is an important move in the right direction, use of currency exchanges is still not ideal. In that regard, you can encourage community members who are unbanked and/or underbanked to open safe, affordable accounts with financial institutions that support low/moderate income communities — such as partners of Bank On Chicago. The federal Consumer Financial Protection Bureau’s current leadership is not supportive of strong consumer protections. While these changes don’t have an immediate impact on consumers, the Bureau’s actions send a signal to predatory businesses like payday lenders that consumer violations are okay. Thankfully, most of the Bureau’s consumer protection authority remains intact. What you can do: To increase the likelihood a complaint is addressed, encourage participants to file consumer complaints with both the Illinois Attorney General’s Office and the Consumer Bureau. We are so grateful to everyone who joined us for this first coalition meeting. We hope that you’ll join us for the second Coalition Connection meeting, which will be held outside of Chicago later this year. More information is to come, so in the meantime, sign up to receive our emails so that you’ll be the first to know about the next meeting and also receive asset building information and resources every month.